Lipids are biological macromolecules made up of carbon, hydrogen and oxygen atoms. Lipids are also made up of a large group of heterogeneous compounds, such as fats, oils, waxes, phospholipids and the derived lipids, such as steroids. All these compounds are insoluble in water but they will dissolve in non-polar solvents such as benzene and carbon tetrachloride. The lipids are made up of fatty acids and glycerol. Glycerol is an alcohol containing three hydroxyl groups (OH). Although carbohydrates are a rapid resource of energy, the energy obtained from lipids is greater than the energy obtained from the same amount of carbohydrates. However, the body does not automatically get the energy from the fats stored in it. This only occurs when there is the absence of carbohydrates. Lipids represent about 5% of the organic materials involved in the composition of a living cell. 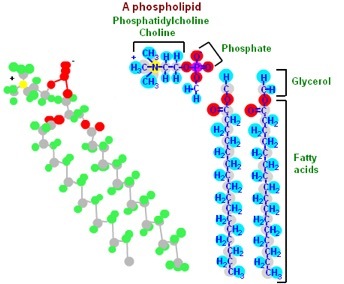 Lipids also have an important role to play in the structure of cell membranes. Furthermore, lipids work as a thermal insulator in animals and humans, meaning organisms can maintain their natural temperatures in cold regions and harsh environments. Lipids can also work as a protective cover for the surfaces of several plants and animals, and some of them can work as hormones. Based on their chemical structure, lipids are classified into three groups: simple lipids, complex lipids, and derivative lipids. These are formed by the reaction of fatty acids with alcohols. Depending on the saturation degree of the fatty acids and the type of alcohol, simple lipids are divided into oils, fats, and waxes. Oils are liquid fats formed by the reaction of unsaturated fatty acids with glycerol. An example is the liquid fats that cover the feathers of water-dwelling birds to prevent water penetration into their bodies. Fats differ from oils in that they are solid substances. Fats are formed due to the reaction of saturated fatty acids with glycerol. Waxes are created by the reaction of fatty acids of high molecular weight with monohydric alcohols. For example, the waxes covering desert plant leaves to reduce water loss during transpiration. 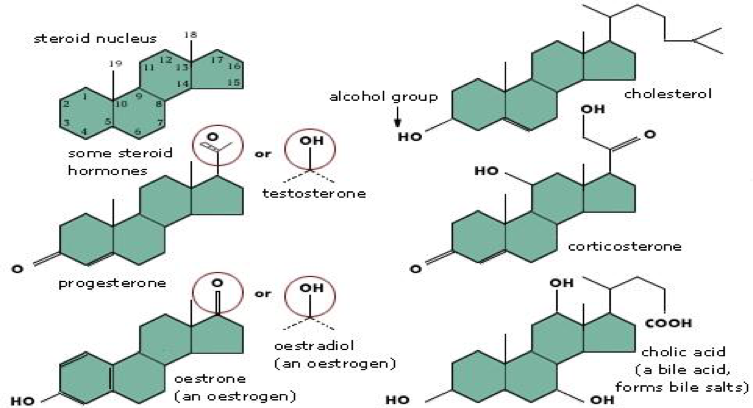 Heterolipids are formed due to a reaction of fatty acids with alcohol. Phospholipids can be phosphoglycerides, phosphoinositides, and phosphosphingosides. Phosphoglycerides are major phospholipids and they are found in membranes. They contain fatty acid molecules which are esterified to hydroxyl groups of glycerol. The glycerol group also forms an ester linkage with phosphoric acid. For example, lecithin and cephalins. Phosphoinositides are said to occur in phospholipids of brain tissue and soybeans. They play an important role in transport processes in cells. Phosphosphingosides are commonly found in nerve tissue. For example, sphingomyelins. Glycolipids are compounds of fatty acids, carbohydrates, and nitrogen, but no phosphoric acid. The glycolipids also include certain structurally-related compounds comprising t gangliosides, sulpholipids, and sulfatides. Derived lipids are the substances derived from simple and compound lipids by hydrolysis. These include fatty acids, alcohols, monoglycerides and diglycerides, steroids, terpenes, and carotenoids. The most common derived lipids are steroids, terpenes, and carotenoids. Steroids do not contain fatty acids, they are nonsaponifiable, and they are not hydrolyzed when heated. They are widely distributed in animals, where they are associated with physiological processes. For example, estranes and androstanes etc. Terpenes are most commonly found in plants. For example, natural rubber and geraniol etc. Carotenoids are tetraterpenes. They are widely distributed in both plants and animals. Due to the presence of many conjugated double bonds, they are colored red or yellow. For example, lycopene, carotenes, and xanthophylls. Essential fatty acids are those that cannot be constructed through any of the chemical pathways known to occur in humans. They must be obtained from the diet. Linoleic acid and linolenic acid are essential fatty acids. Non-essential fatty acids are those which are not necessary to be taken through diet: they are synthesized through chemical pathways. Unsaturated fatty acids have one or more double bonds between carbon atoms. The tow carbon atoms are bound to each other through double bonds and can occur in cis or trans configuration. 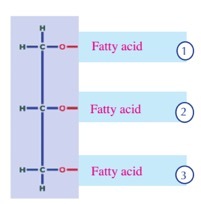 Saturated fatty acids are long chains of carboxylic acids and do not have double bonds. For example, arachidic acid and palmitic acid etc.